While the cliché of wealthy consumers may be that of living a life filled with trust fund–fueled spending sprees, the reality is often much different. 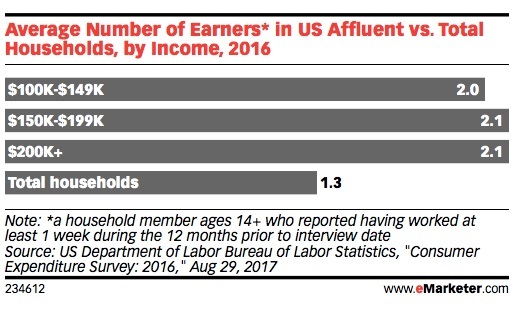 Newly published research from eMarketer on affluent Americans reveals the makeup and behaviors of this segment are nuanced and complex. Specifically, the demographics and spending habits of the group vary significantly from how they’re often portrayed. Contrary to the idea of inherited-wealth playboys and kept women, affluent Americans are in fact more likely to be married and more likely to live in households with two income-earning adults than the population at large, the analysis found. A poll from Deseret News and the Center for the Study of Elections and Democracy at Brigham Young University, as cited by eMarketer, found that 70% of Americans with a household income of $100,000+ were married, compared with 55% of those with an income of $30,000–$99,999 and 25% of those with incomes under $30,000. U.S. Bureau of Labor data cited by eMarketer shows that households in the top income bracket ($200,000+ annual income) have an average of 2.1 earners; this compares with 1.3 earners among total households. A poll by Ipsos Affluent Intelligence Group, as cited by eMarketer, found that 74% of wealthy adults identify as non-Hispanic white—down from 86% in 1992. 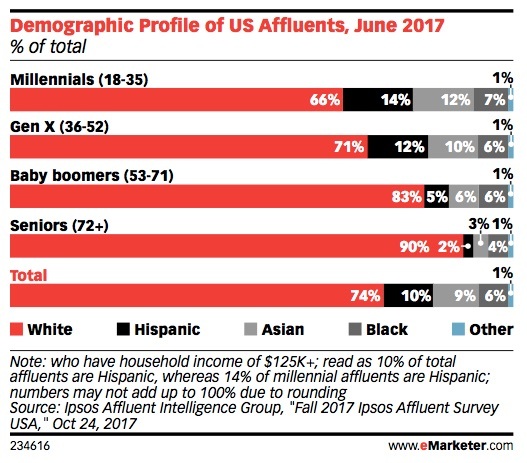 While older affluents are overwhelmingly white—90% of affluent seniors age 72+ identify as non-Hispanic white—the makeup of younger affluents is more mixed: 14% of affluent Millennials identify as Hispanic, 12% as Asian, and 7% as black. Affluent Americans do not necessarily view themselves as financially secure and many are thrifty spenders, the analysis found. A PwC survey cited by eMarketer found that 28% of workers who earn $100,000+ say they find it difficult to meet household expenses each month and 36% use credit cards to pay for necessities that they couldn’t afford otherwise. Moreover, a Harris Poll survey cited by eMarketer found that half of respondents with an annual income of $100,000+ say they frequently worry about their financial situation. A survey by Simmons Research, as cited by eMarketer, found that affluent consumers are just as likely as non-affluent consumers to shop around to take advantage of specials/bargains and to hold off on buying things until they go on sale. 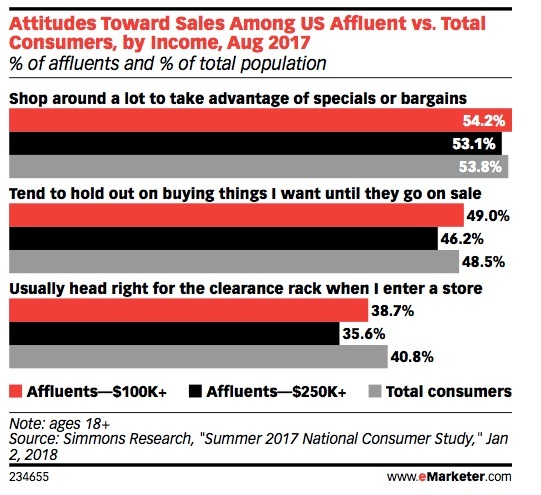 However, affluent consumers are less likely than non-affluent consumers to head right to the clearance rack when entering a store. What do affluents spend their money on? It’s not generally caviar and Gucci bags. The biggest non-housing expenditure in most affluent ($125,000+ annual income) households is transportation (car, etc.) payments (20% of spending, on average). 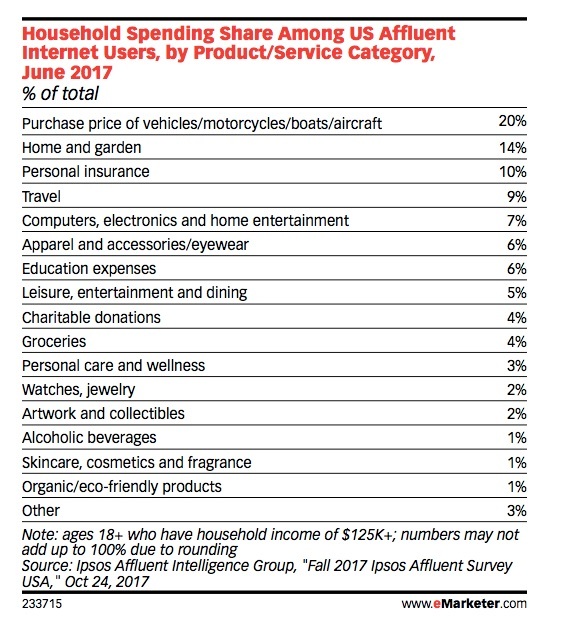 Home-and-garden products/services rank second (14% of spending), and are followed by insurance (10%). Two areas where affluents do tend to spend more on are education and travel. Households in the $200,000+ annual income bracket spend an average of $6,743 per year on educational expenses—more than double that of the $150,000–$199,999 group ($3,015) and more than triple that of the $100,000–$149,999 bracket ($1,841). An MMGY Global survey cited by eMarketer found that 36% of affluents ($125,000+ annual income) identify as luxury travelers (i.e., they agree with the statement: “It is worth paying more for the very best quality for vacation accommodations and transportation”). Similarly, an Ipsos poll cited by eMarketer found that 19% of affluents typically stay at five-star accommodations and 45% typically stay at four-star accommodations. Beyond travel, the analysis found that many affluents are hesitant to indulge in luxury purchases too often. 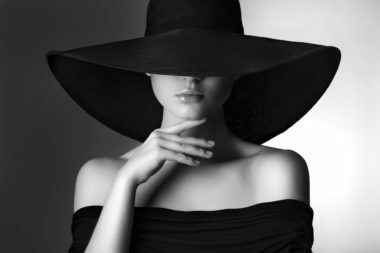 An Ipsos survey cited by eMarketer found six in ten affluents ($100,000+ annual income) purchase luxury goods/services once a year or less, on average, and 21% say they never purchase luxury goods/services. Why this reluctance to indulge? It appears to come back to the idea of financial security. People in the $100,000+ bracket say they would want $111,000 in extra annual income, on average, to feel comfortable buying luxury products/services on a regular basis, and people in the $250,000+ bracket say they would want an extra $179,000, on average, to feel comfortable. So, what should marketers make of all this data? First, you should not assume affluents are idle, with plenty of free time. Most are married, family oriented, and part of stressed-out, time-strapped, two-worker households. Second, recognize that most affluents do not see themselves as affluent. 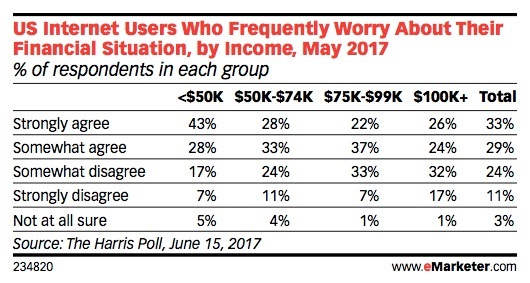 The majority of high-income Americans are still concerned about paying the bills and do not feel that their financial situation is secure. Finally, do not assume that wealthy consumers are willing to spend blithely. The bulk of affluents are working to earn their income and are not willing to part with it easily. They do occasionally indulge in luxury—especially on experiences such as travel—but for the most part they are careful with their spending. Ultimately, affluent consumers tend to worry about money, shop around, and wait for sales—in other words, they tend to behave remarkably similarly to non-affluent consumers. Stay current on luxury marketing news. Contact MDG Advertising today at 561-338-7797 or visit mdgadvertising.com.